It started with a trickle and then it turned into a flood: London is being swamped with crazy road narrowing schemes on major cycling routes; the worst of which will see two lanes out of four turned into pavement and yet even there, the only provision for cycling will be advisory bike lanes that stop and start along road space that is made deliberately narrow. These schemes will be in place for at least the next 20 years, in most cases. Goldhawk Road now. Will be reduced from four lanes to two but with only intermittent, advisory bike lanes. In Tottenham, TfL is proposing to remove part of a gyratory. It will also remove one lane of motor traffic AND remove the existing segregated bike track. Now, the bike track itself could do with an upgrade. But why on earth is TfL ripping up bike infrastructure and creating acres of paving space, rather than using the masses of new space it is creating and making a decent bike-friendly link in this part of Tottenham? Rachel Aldred blogs about this in brilliant detail, declaring that the engineers simply haven't thought about cycling here. You can comment on the scheme on TfL's website but even if you do, TfL only wants your views if you're either a "resident; business; bus user; or motorist". Screw the cyclists. In any event, I'd urge you to read Rachel's blog and comment on the website. Plans for Goldhawk Road. See that blue bit? That's not a bike lane, that's road space that will be taken and given to trees. 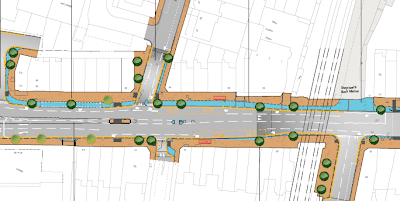 Meanwhile, just west of Shepherd's Bush, TfL and Hammersmith and Fulham council have designed schemes on Goldhawk Road, Uxbridge Road and others, to narrow the carriageway and plant lots of trees. The schemes, as they say, have been designed by "residents and businesses and further consultations with local businesses, schools, the police and London Buses". Note, no consultation with people who think and care about making cycling safe and convenient here. You can see the schemes and respond to the consultation online here. 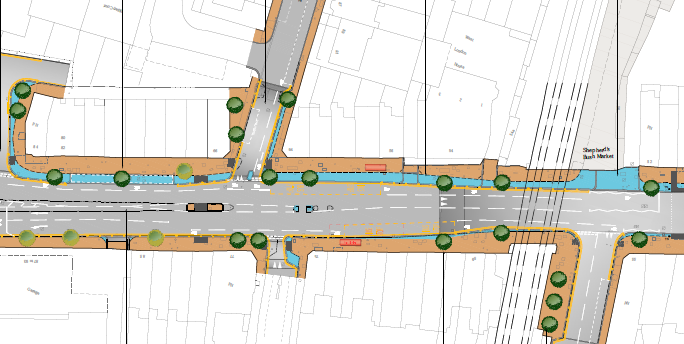 According to Hammersmith & Fulham Cyclists: "The overall plan is for what was two lanes each way to become a 3.5m wide lanes and a 2m wide cycle lane each way. 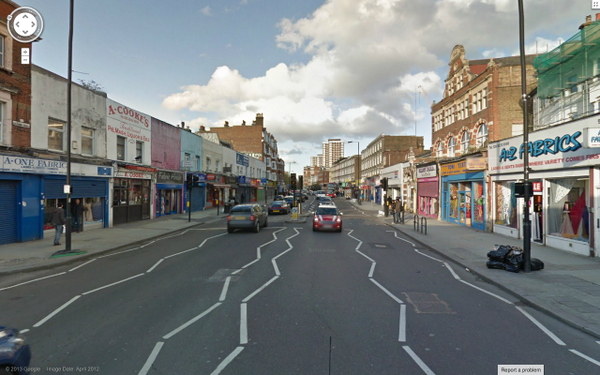 This does mean that a bus lane is being relinquished and cycle lanes are replacing them." Sounds great, doesn't it. The problem being the bike lane turns into bus stops at regular intervals, randomly narrows here and there due to extra pavement widening and disappears entirely at major junctions. It's definitely a step in the direction of cycling but a real missed opportunity to deal with some major problems. This review by H&F Cyclists is well worth a read. If you want to see something really bonkers, though, look at this scheme in Lewisham. Over in Ladywell, the countil plans to remove trees on one side of the street to create parking spaces. And then build NEW trees on the other side of the street that completely and utterly block the cycle track along this main street. There is something systemically wrong going on and a complete failure by councils and TfL to properly secure safe space for cycling in these new schemes. 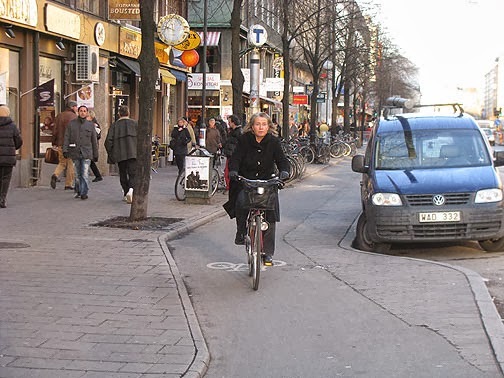 The money is being spent to remove space from motor traffic but instead of some of that space being given to make cycling a safe option, instead it is going to trees and making cycling even less appealing in most of these examples. To top it off, this is what sums up what is going on: Transport for London has decided to go ahead with building a new crossing of the Thames, east of the Blackwall Tunnel. TfL's review concludes: "[It is] clear that there is a strong appetite within the public and stakeholders for TfL to consider crossing improvements for cyclists, pedestrians and public transport users". Great, you think, TfL is going to make it possible to cross the river by bike, not just by car. Except that's not the case. Read the report in detail and this is what is promised to make it easier to cycle from south of the river if you live in SE London: "Cyclists and pedestrians are not permitted to use Blackwall Tunnel, for safety reasons. We anticipate that Silvertown Tunnel would not be accessible to cyclists and pedestrians for the same reasons. Pedestrians and cyclists can use the Emirates Air Line cable car, which links the same places as the proposed Silvertown Tunnel." Cable car??? What's the point in a review that declares 'cyclists need somewhere to cross the river' and concludes 'cyclists won't get anywhere to cross the river'? It's completely insane. I feel like the Mayor is doing great things to put cycling on the map. He has a great vision, plans for some really good quality schemes on certain routes. But at the heart of Transport for London, precisely nothing has changed. Cycling is being ignored on 90% of new road investment in London. And that's because the TfL machine is massive and only has a handful of people worrying about cycling. How come London buses get to advise and agree every single new scheme in London but London cyclists don't, for example?